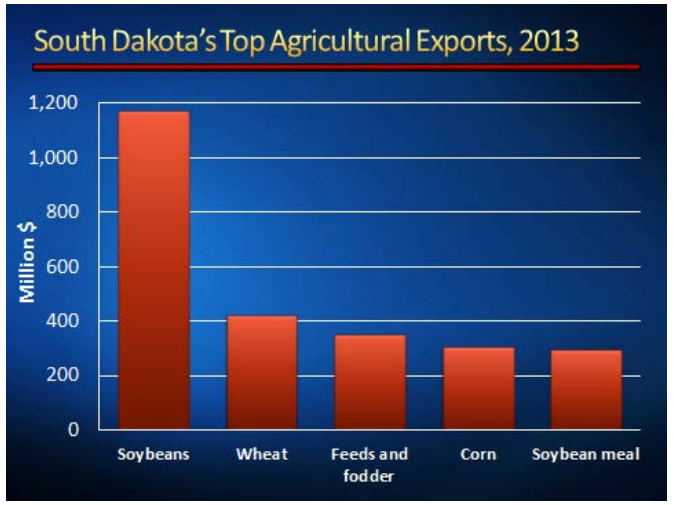 Global trade and exports have become a vital part of the South Dakota economy. There were 939 different South Dakota companies exporting goods in 2013, 75% of which were considered small or medium-sized businesses. Their total value of goods exported totaled over $1.6 billion which supporting thousands of jobs. But leading the way in exports are the state’s family farmers who exported over $3.8 billion worth of grain and feed in 2013. This is up from just $2.8 billion in 2009, a 35% increase. That enormous impact supports approximately 28,500 jobs, both on the farm and in related industries such as food processing, transportation, and manufacturing. To continue this positive trend, and to keep America competitive in foreign markets with a strengthening dollar, the South Dakota Corn Growers Association and others feel it is necessary for Congress to grant President Barrack Obama Trade Promotion authority, which expired under President Bush in 2007. This would enable the president to fast-track the pending Trans-Pacific Partnership trade deal, enhancing America’s trade opportunities with some of world’s fastest growing nations when it comes to buying power. Agricultural exports are an American success story and with open markets, farmers will be able to do even more when it comes to feeding the world while continuing our country down a path of economic growth. Read more about what’s at stake for South Dakota with the pending Trans-Pacific Partnership trade deal. This entry was posted in News and tagged corn, exports, farm, jobs, South Dakota, TPA, TPP, trade.